June 21st may be the official start of summer, but everyone knows that summer really begins on Memorial Day weekend. This is an important time of year. Not only can you now wear white with confidence, but you can also start hosting cookouts. That means it's time for grilled hot dogs smothered with mustard and relish, buttery ears of crisp golden sweet corn, and big bowls of creamy, tangy potato salad. 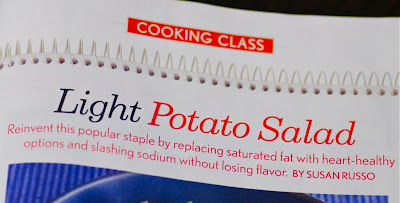 I'm excited to announce that I am featured in the "Cooking Class" section entitled "Light Potato Salad" in the June 2010 issue of Cooking Light. It's on page 133 (not that I have it memorized), but if you don't have the print version, you can still get the recipes online and check out the reader reviews. In the piece, I give you tips on how to make perfect potato salad and how to make lightened potato salads that are small on fat and calories and big on flavor. These potato salads are so flavorful, you won't even miss the mayo. Neither will your belly in your bikini. 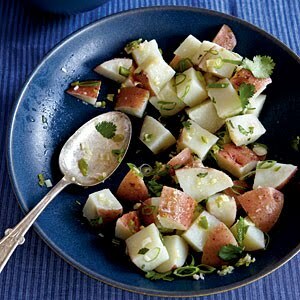 Farmers' Market Potato Salad: This salad was selected as one of the "Greatest Hits: 2010" by Cooking Light staff. 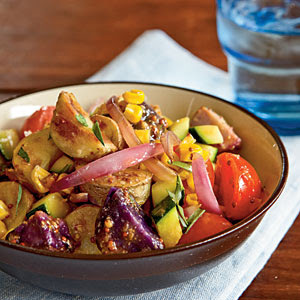 This warm potato salad features tender tri-color fingerling potatoes and beloved summer veggies including sweet corn, zucchini, and cherry tomatoes. It's dressed with a zesty Dijon and tarragon dressing. One reader said, "It is truly the best potato salad I've ever had, hands down." 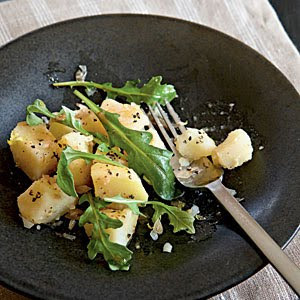 Lemon-Arugula Potato Salad: My personal favorite, this salad features creamy Yukon Gold potatoes blanketed with peppery arugula, pungent shallots, and tart lemon. Lemongrass and Ginger Potato Salad: This Asian inspired potato salad features bold lemongrass and fragrant fresh ginger. It's the ideal companion to grilled meats and seafood, such as chicken and shrimp. All photos by Becky Lulgart-Stayner; food styling by Cindy Barr. Congrats Susan! I now have my eye on lighter dishes, to which you seem to have a knack for. Congrats on Cooking Light! It looks like a delicious potato salad. Congrats on being featured in Cooking Light! That's great Susan. Congratulations. I like them all, but especially the one with arugula. Congratulations, Susan, lovely salads, all! I especially like the one that starts with roasted potatoes and sweet corn. Congrats, Susan! All the salads look great, but I love the Farmer's Market salad... it's beautiful, too! Congrats! Can't wait to give one of these salads a whirl! Your salad recipes look delicious! Congrats on the feature in Cooking Light! Congratulations! My mom has been a subscriber to Cooking Light since I can remember, many of the dishes I grew up on came out of that magazine. Memories. I prefer Russian style potato salad with that strong vinegar-and-dill bite but now I'm going to have to make one of these! Oh babe congratulations! I'm so proud of you! linda-Me too. I never tire of arugula. michelle-I hope you do! Thanks! alanna-The roasted veggies add depth of flavor for sure. karen-And it's just the season for it too! That's really winning news Susan! Congrats. Love potato salad and now with triple digit temps, it's great. Wonderful variety here. Well done, Susan! I love the look of that vegetable potato salad. Congratulations, what an accomplishment. Cooking Light was a must have for me for many years. Congrats on the feature!! I'm always looking for lighter recipes to try. I'm a subscriber and when I saw the byline I did a double-take wondering if it was you. Congratulations! The recipes look great, too. what a tremendous accomplishment, susan--congrats! Way to go, Susan! That's great. And I love all your potato salads. tanna-Thanks! Triple digits already? Don't forget the mint juleps then! lydia-Thank you! I love that one too. kathy-Thank you! Hope you try them! Wowwww! So glad you pointed this out. I've read the article already but didn't catch the author. Congrats- all looks delicious!! Love the lighter approach. I've made what is called a French potato salad for the past couple of years. Hold the mayo and a light dressing of oil and vinegar. Everyone loves it and like yours, not only better for you...but also the added advantage of being more portable for picnics; no mayo to have to keep cold! Can't wait to try these; they all look so good. Susan, congratulations!! I'm going to go grab my copy right now and take a look! Wonderful potato salads! The hardest part would be choosing which one to make. High fives to Cooking Light on snagging you to do a column for them! Congratulations! Your potato salad looks delish. I love that it includes corn and zucchini--and hot pepper sauce! I will have to pick up a copy of the June issue; looks like you have come up with some flavorful salads. Love the lemongrass. Congrats Susan! CL is the one magazine I have faithfully been subscribed to for years! I'm excited for you! Hooray! Well done on the feature in Cooking Light. Congrats! And I've read through that magazine twice now and not realized you wrote that article! I *know* someone famous now. Hee. Wonderful article, Susan - congratulations! 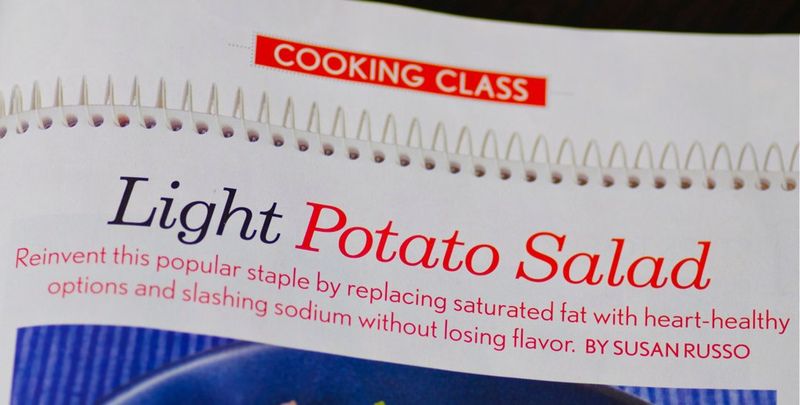 I was reading Cooking Light on a plane this week, and didn't notice the buyline. Of course, I went and dug it out of my briefcase again when I saw your post and was thrilled! Fantastico! Each of the potato salads clearly has its own personality. The farmer's market salad will certainly grace our back deck this summer. barbara-I agree. My mom was always terrified of food poisoning with mayo dressings but didn't worry with oil and vinegar. Honestly I prefer o & v to mayo anyhow. lisa-The hot pepper sauce definitely adds kick! tabletalk-Oh, I appreciate that. It's a great issue, so I know you'll find many delicious, healthy recipes! grumpandhoneyb-I have been a subscriber for years too. It's a great magazine. livinlocal-I'm so happy to hear that. I think you'll be pleased! I can't decide whether the Farmers Market or the Lemony Arugala is first on my list to try. I'm def picking up that issue. Great idea! congrats! I'm not usually a potato salad fan, but these all sound so wonderful. I will have to check them out! Lemon-Arugula Potato Salad?! That has all my favorite words in it....can't wait to see how delicious it tastes! Ohhh... Susan. I just made the Farmers' Market Potato Salad and it is super-fantastic! I'll always love my old-fashioned mayo-based version, but this was a sophisticated, stepped-up take that will definitely be sticking around for many encore performances! Well done!! Congratulations on the feature! I can't wait to try the Farmers' Market potato salad next Wednesday when I hit our local market.